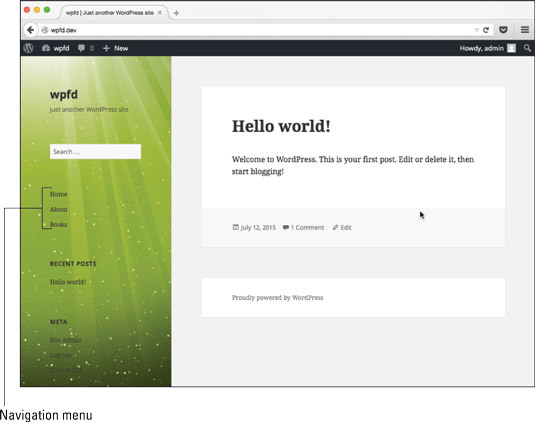 A navigation menu lists the links displayed on your WordPress site. These links can take you to pages, posts, or categories within your site, or to other sites. 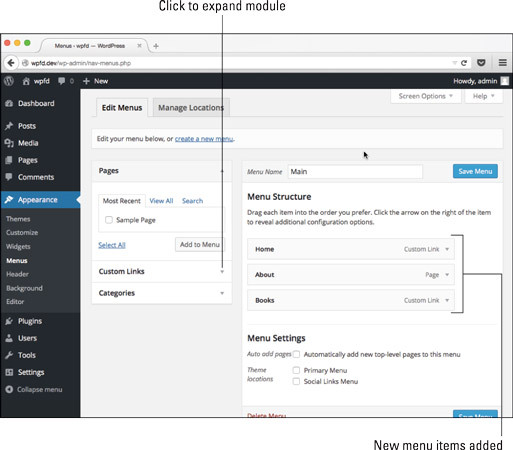 No matter what they link to, you can define navigation menus on your site through the built-in menus feature in WordPress. It’s a good idea to provide at least one navigation menu on your site so that readers can see everything your site has to offer. Providing visitors with a link — or several — to click is in keeping with the point-and-click spirit of the web. Much like the drag-and-drop widgets feature that enables you to tweak areas of your site without knowing hardly any code, the menus feature offers an easy way to add and reorder a variety of navigational links to your site as well as create secondary menu bars (if your theme offers multiple menu areas). The menus feature is already built in to the default Twenty Fifteen WordPress theme and offers two menu locations, so you don’t have to worry about preparing your theme for it. Not all themes have this feature available, though, because you have to add support for it in the theme functions file. Choose Appearance → Menus on your Dashboard. The Menus page reloads with a message that your new menu has been created. The Menus page on the Dashboard. Pages: Click the View All link to display a list of all the pages you have currently published on your site. Select the check box next to the page names you want to add to your menu and then click the Add to Menu button. Custom Links: Expand the Links module by clicking the arrow on the right, and then in the URL field, type the URL of the website that you want to add (for example, type www.google.com). Then type the name of the link that you want to display in your menu in the Text field (in this case, type Google). Then click the Add to Menu button. Categories: Expand the Categories module by clicking the arrow on the right, and then click the View All link to display a list of all the categories you’ve created on your site. Select the check box next to the category names you want to add to the menu and then click the Add to Menu button. (Optional) Edit your menu choices by clicking the down arrow to the right of the menu item name. When you’re satisfied with your menu choices, click the Save Menu button on the top-right of the Menus page. A message confirming that the new menu has been saved appears. You can create as many menus as you need for your website. Although the main navigation menu (which is determined in Appearance → Menus → Manage Locations → Navigation Menu) appears below the header image on the Twenty Fifteen theme, menu widgets are available that allow you to display other menus you’ve created in different areas of your website, such as the sidebar or footer, depending on your theme. Rearrange menu items: Use the drag-and-drop interface on the Menus page to rearrange your menu items by clicking a menu item with your mouse, dragging it to the desired location, and then releasing your mouse to finalize its position. Dragging the About menu link to the top of the menu. Create subpages under top-level menu items: To create a subpage, move a menu item slightly to the right and below the top-level item. Subpages can be especially handy for sites with lots of page content because they enable you to avoid cluttering the navigation bar and to organize content logically. Click the Save Menu button to ensure that any changes you’ve made to the menu are saved and applied to your website. Dragging the About menu link under the Home link to create a submenu item. Check out this site with the navigation menu displayed under the title of the site. The navigation menu appears under the title of the site in the left sidebar.